Offering you a complete choice of products which include tropical quilts, cotton kantha quilts, kantha quilt, handmade kantha quilts, ikat kantha quilt and handmade kantha quilt. 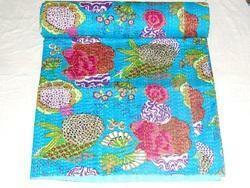 Beautiful Turquoise handmade Kantha floral Tropical Quilts bedspread bedding. Made with 100% cotton and natural vegetable colors. This piece is of art is completely hand stitched by artisan in Jaipur, India. This Kantha blanket throw can make any room alive with its vivid colors, stunning print and embroidery, made using traditional and famous Kantha hand embroidery method. Made from two thin layer of cotton fabric, making this piece of art irresistible and also very comfortable. Adding to it's style, this Kantha quilt is reversible and both sides can be used.Suitable as a Twin sized bedspread or doubled over as a decorative bed and sofa throw. This gorgeous piece of Kantha Can also be used as a blanket or quilt in summers instead of heavy hot and heavy duvets. We hold expertise in manufacturing and supplying a unique collection of Cotton Kantha Quilts. These Stylish Kantha Quilts are very comfortable to use and ideal to use for all weather conditions. Owing to its excellent softness and smooth textures, these Handmade Cotton Quilts are widely preferred by various clients. Following the demands of clients, we provide these quilts in various elegant designs, fantastic colors and alluring patterns. We are the prominent creators and suppliers of Old Style Kantha Quilts of fine quality. Stitched all over with the colorful threads, we provide them in assorted range of colors and patterns. They are made using vintage sarees that have been stitched together in a running stitch. Buyers are free to choose from multiple sizes and colors. The unparalleled quality and economical prices has made them popular amongst various clients. 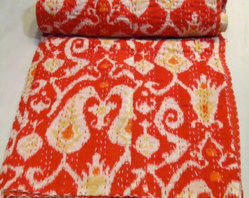 We offer a wide range of Handmade Kantha Quilts. 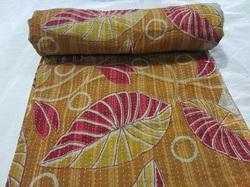 Kantha quilts are considered alluring for their excellent quality and fine stitching. The patterns on the quilts are dexterously made by hands with the use of colorful threads. These beautiful quilts are made using saris that are pieced together and then stitched all over. Each quilt is unique and distinct with patterns on both the sides. We make these available in different colors and sizes. 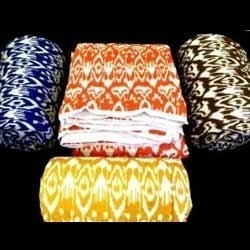 We offer Ikat Kantha Quiltt that are masterpieces created by our artisans. They attract the consumers owing to their unique, aesthetically appealing design patterns. 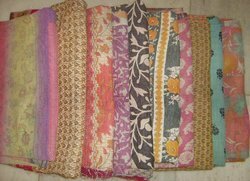 Kantha quilt blankets are very popular with tourists. The traditional embroidery skills are applied to result in products that have an ethnic look. We make these available at standard prices. Our Handmade Kantha Quilt are made from vintage sari's, pieced together and then stitched all over with running stitch. Each one is unique and has different colours and patterns on either side. As these are vintage items they may have patches and slight imperfections, we think this is part of their charm.